For nearly seventeen years, Binghamton students have been filled with Bearcat pride. Today students can attend basketball games with a guarantee of seeing Baxter and the BU Zoo. However, if you attended a game prior to 2000, you would have had a very different experience. 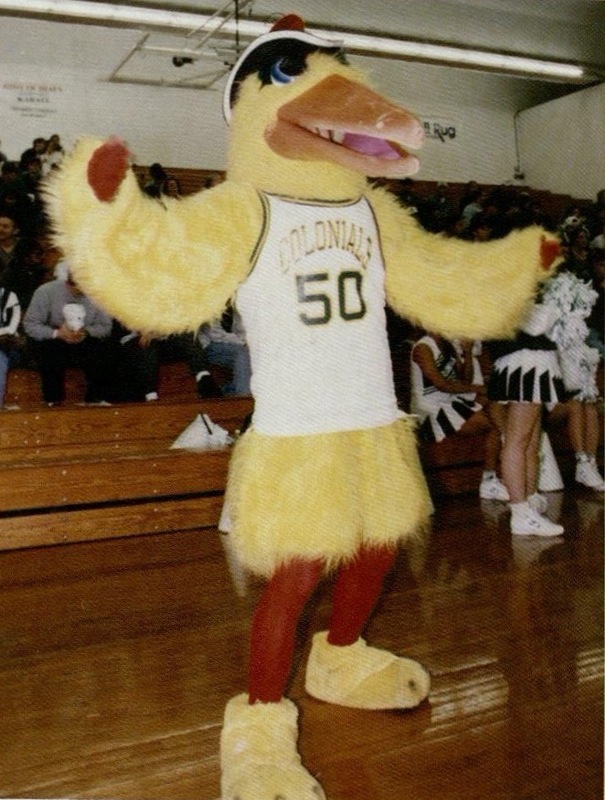 From a donkey with a tendency to bite students to a chicken costume that stole the show, Binghamton’s quirky mascot history will probably surprise you. In 1954, four years after the founding of Harpur College, a project was launched to choose a mascot for the college. While the American Eagle, Irish Wolfhound, and Great Dane were all contenders, the Mexican Burro ultimately became the first official mascot. The senior class sponsored the election and purchased a live burro as a graduation gift to the school. 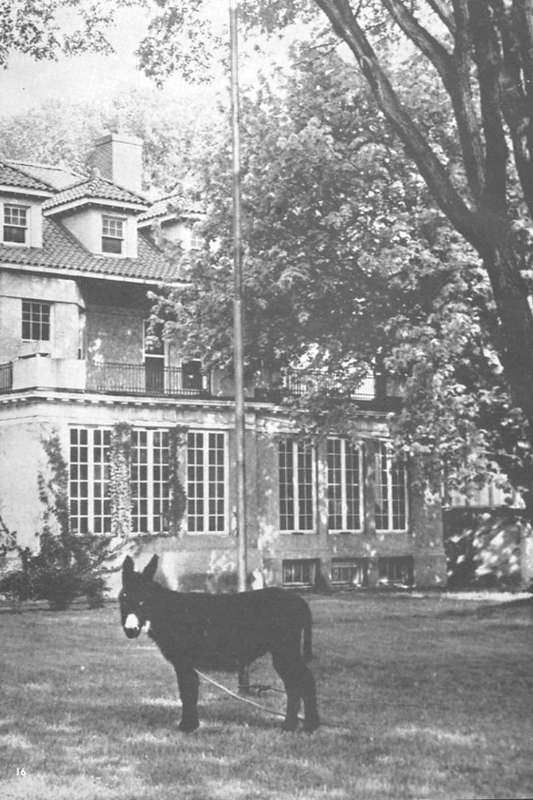 Harpo the Mexican Burro was tethered to the flagpole but became aggressive, kicking and biting students. President Glenn G. Bartle eventually had to remove Harpo for students’ safety. Photos courtesy of John Affleck, former basketball coach, and Binghamton University Archives. The Binghamton Colonials, named for Colonial Hall on the Endicott campus, were without a mascot for years after the removal of Harpo. 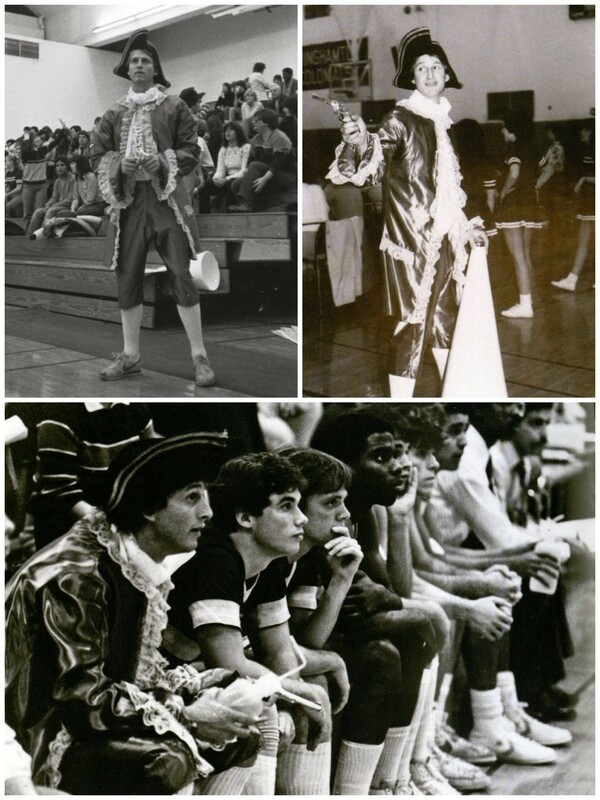 So in the 1980-81 basketball season, sophomore Bill Paolillo ‘83 took his shot at becoming the Colonial. Paolillo, an injured track team member, bought a Paul Revere costume and tri-cornered hat from the Salvation Army to spice up basketball games, and Colonial Bill was born. Colonial Bill brought basketball games at the West Gym to life with his enthusiastic stomping on bleachers, taunting of the opposing team and attempts to distract opponents’ free-throw attempts with his cap gun. Photos courtesy of the Press & Sun-Bulletin and Binghamton University Archives. After Colonial Bill graduated in 1983, Neil Berg '86 stepped up to the plate and became the next Colonial mascot. Known as Colonial Woody for his Woody Allen-style glasses, Berg obtained a Colonial costume of his own and borrowed a horse from the equestrian team. To increase game attendance, he rode into each dining hall challenging students to come to upcoming games. A friend even introduced Colonial Woody with live trumpet fanfare. Attendance really started to increase when he promised students free beer, as the drinking age was 18 at the time. The devoted students became known as “The Psycho Squad” for their rowdy behavior and inappropriate chants. Photo courtesy of Kris Ahrend '92. 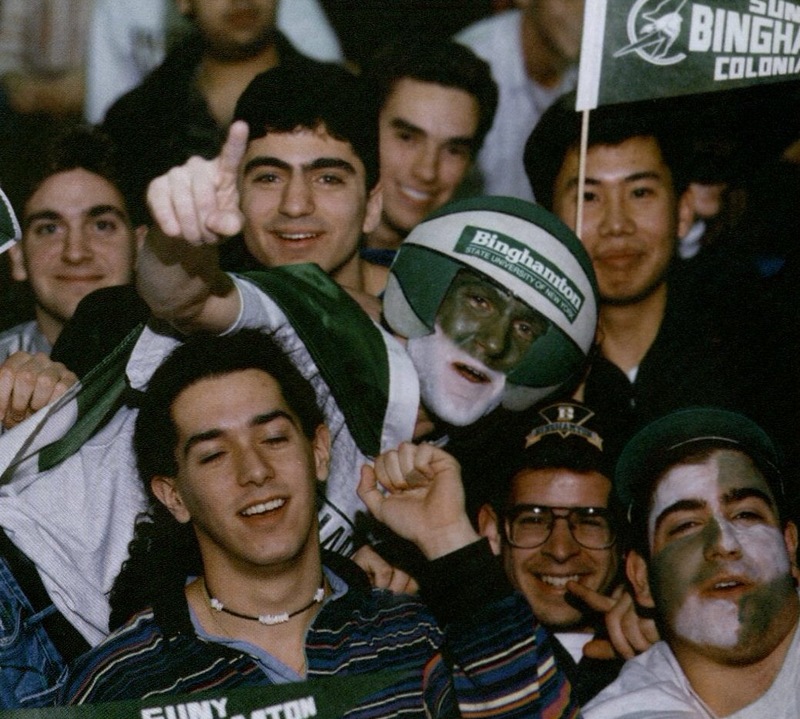 Binghamton’s mascot had yet another vacancy after the graduation of Colonial Woody in 1986. Kris Ahrend '92, president of Dickinson Town Council (DTC) was working with his executive board to come up with a way to increase school spirit and entice students to attend Dickinson Night at the men’s basketball game. He suggested DTC rent a costume to be Dickinson’s unofficial mascot. The best available costume for that night was a chicken costume, so a “D” was attached to the chest of the suit and the Dickinson Chicken made its debut. The stunt was so successful that the University bought the chicken suit. The Dickinson Chicken quickly became the Colonial Chicken and received its very own jersey and tri-cornered hat. While Ballhead was not a university mascot, he did become a staple at basketball games. A number of students held the role in the 1990s. All of the Ballheads wore a basketball on their heads with green and white facepaint. Ballhead could be found at games screaming at the top of his lungs and energizing the Psycho Squad, making the stands come to life. 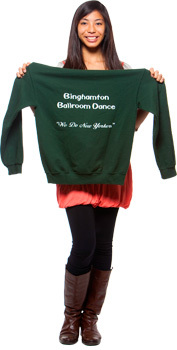 In May 1999, Binghamton University reclassified to NCAA Division I. Following this announcement, Binghamton said goodbye to the Colonial and introduced its new mascot: the Bearcat we know and love today. Binghamton was looking for a mascot that was gender-neutral, powerful and dignified. Associate Director of Athletics John Hartrick, who co-chaired the logo design committee, described the Bearcat as "a mythical animal that combines the power and ferocity of a bear with the cunning and quickness of a cat." In 2001, Binghamton’s Bearcat was named “Baxter” during Midnight Madness. 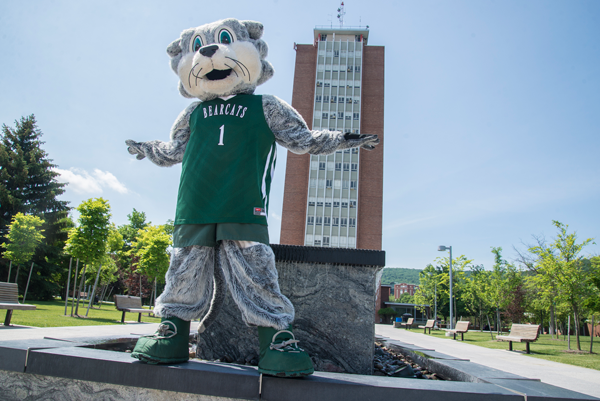 Baxter the Bearcat won SUNY Mascot Madness in 2014 and 2015, a testament to the Bearcat pride we have at Binghamton. Students interested in becoming a part of Binghamton’s mascot history can even apply to perform as Baxter. Baxter is currently competing against all SUNY mascots in the 2017 Mascot Madness competition. Be sure to vote for Baxter and show your #BingPride!